Operate a small pharmacy is not easy as tracking of the medical drug can be a big mess to some small business owner. To get a complex medical supply tracking system can be costly to some small business owner. The business could be small, but the operation could be complex; and getting a high cost system could be impossible to some small business owner. If the objective is to track the batch number, expiry date, stock on hand and reorder point, then you may consider using MoneyWorks accounting systems — An accounting software that works for small businesses. With a little “modification”, MoneyWorks can track the batch number and the expiry date too. If the batch number is unique and not more than 14 characters, you may use the Product Code field to record the batch number. Note: The maximum number of characters (field length) for Product Code is 15, but we are going to use not more than 14 characters; we will come back to this shortly. Next, you may combine the actual product code and the product description in the product name field with a “-“ in between to separate the product code and product description. 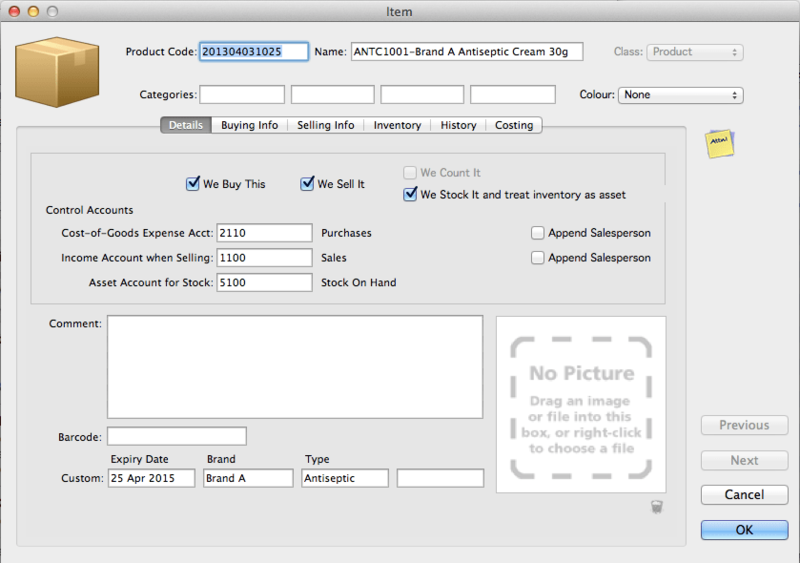 Then, customise the Product Custom fields to track the expiry date, brand and type of product. In our case, we are using Custom1 for Expiry Date, Custom2 for Brand and Custom3 for Type. In the Product List view, you may pull out those relevant fields such as Custom1 (Expiry Date), Custom2 (Brand) and Custom3 (Type) onto the list view. You may also use the Slice() function to separate the Product Code and the Product Description. The result for this “Product Code” field will be “ANTC1001”. 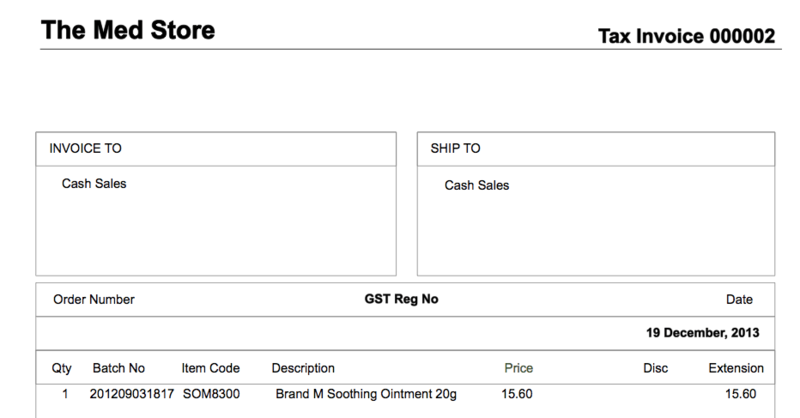 The result for this “Product Description” field will be “ Brand A Antiseptic Cream 30g”. During invoicing, you can search by either the “Batch Number”, “Product Code” or “Product Description” for a product. You can hide those obsolete products by adding a “~” in front of the product code, such as “~201010031830”. This is the reason why we are not using more than 14 characters for the product code although the maximum field length of Product Code is 15. In your template design, you can separate the product code and product description with a Slice() function too.